Join Guestline and Tierney’s – with their key partners, Google, Cadenza, Digital Alchemy and GuestRevu – for a networking event to hear the latest tips and innovations in the Irish hospitality market. Share fresh ideas and best practice with like-minded hoteliers from across the region and industry experts. 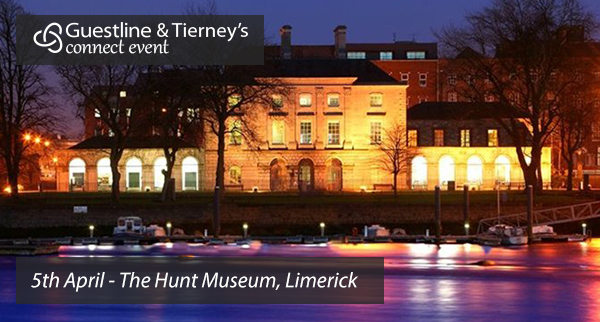 This will be your opportunity to hear from technology experts and network with other hoteliers…all in the comfort of the The Hunt Museum in Limerick. Complimentary refreshments and finger food will be served. 10.00 – Welcome and introduction – Guestline & Tierney’s An overview of the range of cloud-hosted, integrated hospitality software solutions available on the market and the importance of partnerships in business. different channels. Take action to bring them back to brand.com.Create a simple visualisation of sales by market. To Register: for this free event, Please Click on the link,scroll to the end of the page and fill in your details to register your interest and we will confirm your attendance.